Intastop offer a range of anti-ligature products in response to the report of the National Confidential Enquiry into Suicide. This report made several recommendations including the coverage or removal of all likely ligature points. At the same time, abuse of staff by inmates is steadily rising and in areas where doors and screens may obstruct the vision of colleagues or security personnel, Intastop offers a range of products to facilitate the taking of essential safety precautions including vision screens, door closers and anti-barricade solutions. 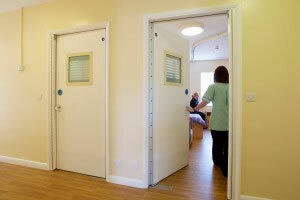 The Harbour is a new state-of-the-art 154 bed mental health facility near Blackpool. Its ethos is to provide therapeutic care which is empowering, person centred and needs led and focusses on promoting recovery and independence. With that in mind and following a safety by design practice the Trust wanted to commission products that would provide ultimate patient safety and comfort. Rotherham Doncaster and South Humber NHS Foundation Trust (RDaSH) operates services in 200 locations across Rotherham, Doncaster and North Lincolnshire. It provides an inpatient and community mental health, learning disability and addiction services for adult, young people and children. The trust required a solution to help prevent the possibility of suicide from door tops while not compromising the integrity of the door in terms of fire, safety, privacy and functionality. Rotherham Doncaster and South Humber NHS Foundation Trust (RDaSH) operates services in 200 locations across Rotherham, Doncaster and North Lincolnshire. It provides a range of inpatient and community mental health , learning disability and addiction services for adult, young people and children. The solution offered by Intastop was to ensure the door had full anti-ligature protection with the Door Top Alarm and fully clad the door in high quality anti-bacterial impact protection sheet which prevents water absorption and protects from damage.